Booo it’s Monday but that means it’s Ice Cream Day !! So, no.2 Ice cream is Ben and Jerry’s Cherry Garcia. B&J is like such a fun, colourful, happy ice cream thing. I was at Ben & Jerry’s in Vivocity Singapore last year and you can see they’re all bright and happy. Isn’t it just the place to be to cure any weekday blues ? hehehe. Place the chocolate shavings and the cherries in separate bowls. Cover and refrigerate. Whisk the eggs in a mixing bowl until light and fluffy, 1 to 2 minutes. Whish in the sugar, a little at a time, then continue whisking until completely blended, about 1 minute more. Pour in the cream and milk and whisk to blend. After the ice cream stiffen (about 2 minutes before it is done), add the chocolate and the cherries, then continue freezing until the ice cream is ready. * I used more chocolate shavings and cherries actually for the ice cream. * The ice cream was lovely with all the chocolate crunchy bits and stuffs, but it melted reallllllyyyyyy quick. The first photo I took was fine and dandy, then during the 3rd click, I could already see little meltings of it already. Yum… be sure to check back next Monday for another installation of Ice Cream! I wish… I wish that I'll get an ice cream maker. Where did you get urs? If you notice when I post the Cherry Garcia Ice Cream, it was in January and summer months in Australia ranges from December to February. I made it the night before. I thaw it for 30mins the following day. I set my camera and tripod up. I scoop into a bowl that I freeze overnight, shoot and snap snap and eat! All in less than 5 minutes! And I did this at 9am in the morning when it is not that hot yet. I have to agree though in Malaysia, it's pretty hard. Can't wait for the next ice cream installation! I'll lug back some fresh cherries for you if I am coming back to Malaysia end of this year, pinky promise! @wendy: I got mine from Homedec, it's a Cuisinart. But I think you can get in Harvey Norman / Robinsons those places..
Nice click. 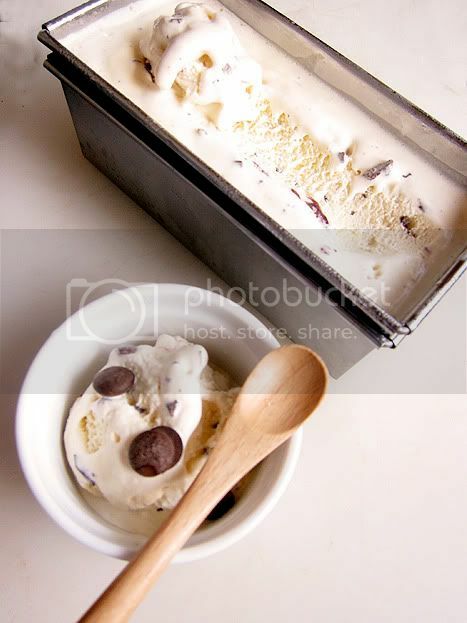 I usually chill the the cream first for few hours and churn the cream in the ice cream maker later in the evening. I think your ice cream looks fantastic. Cherry Garcia is my second favourite flavour from b&j;. Looks fantastic! Too bad I just went on a diet! @A cupcake or two: Thanks 🙂 so what's your first ? @Shirley : Haha yeah, otherwise my mum will kill me because the condition was if she buys the machine, I have to make it at least once a week or twice. Home made ice cream is still the best! I would love to have my own ice cream maker! Bad Behavior has blocked 1398 access attempts in the last 7 days.